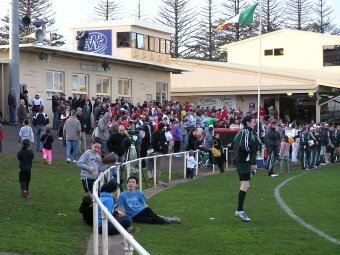 Throughout the day the spectators slowly began to gather for the much anticipated semi-finals at Reid Oval, Warrnambool in country Victoria. The 5:30pm slot featured reigning champions New Zealand against the previous winners Ireland. This promised to be a good match and although the scoreboard didn't reflect the contest, the crowd would've gone home knowing they had seen quality football. The Kiwis have brought an improved game since their victory in 2005, according to Team Manager Jum Lucy they've improved their fitness and running handball. That became apparent immediately, although they still have very good structures as per the last International Cup. Precision kicking and leaving space for the forwards was the order of the day, and 21 year old Nic Cuneen was the first to pounce, brilliantly side-stepping the oncoming traffic to drive a low skidding ball through the goalsquare. Soon after he received a free and delivered out in front to Richard Bradley, a dominant forward this tournament. He kicked truly. The New Zealanders were running the ball and kicking with precision. Two more passes out in front with two more good marks, this time to Moss Doran (currently playing for South Warrnambool). He missed both shots which was just as well for the somewhat shellshocked Irish, no to mention the crowd of around 2000 who were mostly supporting the Warriors from Ireland. 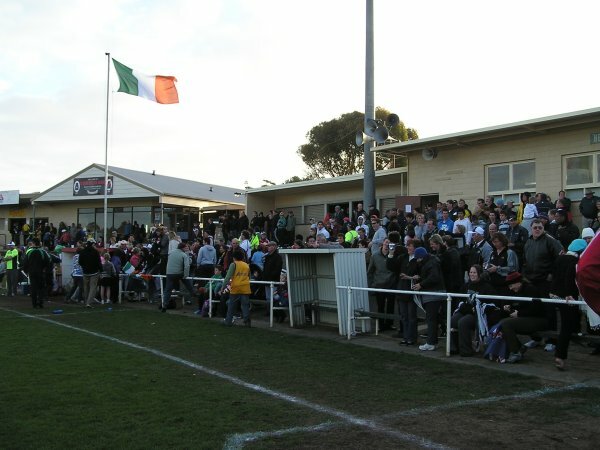 The wind was mainly to the grandstand and clubrooms side, giving neither team any major advantage. At times the Falcons formed a wall across half-forward, locking the ball in and preventing an Irish clearance. Bradley took a strong mark put this time missed, but soon made amends after another nice lead and lace out pace. When Cuneen marked then broke clear to boot another the game was as good as won, all in an amazing first quarter of footy. Ireland had displayed good skills in the opening stanza yet had been blown away. In fact after the game when asked if that was, ironically, the best Ireland had played in the tournament this year, Irish staff agreed, saying the New Zealanders had brought the best out of them. A big pack mark to Liam O'Connor and subsequent goal from 15m out gave the Warriors some hope. There was a bit starting to happen off the ball, a few niggles and a push and shove, but the fast paced game meant the players didn't have time to explore those possibilities. Ireland had a good pacth of around 10 minutes where they controlled the play but couldn't kick a major. Finally O'Connor again marked and duly went back for his shot, going through his routine of throwing some grass in the air to check the window. He allowed for the strong cross-breeze but the ball failed to swing back and registered only a behind. 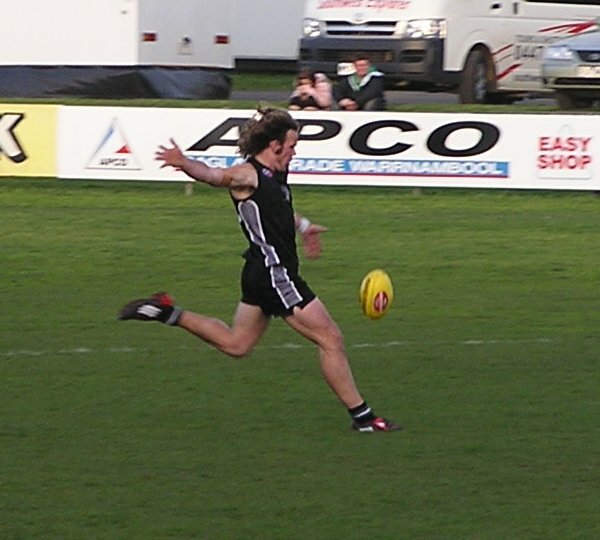 New Zealand's University Blues player James Monaghan received the footy after an interception by his team-mate and slotted the goal across his body. Ireland's Mick Finn was holding back the floodgates, taking both contested marks and dropping back into the hole that the New Zealand forwards were working hard to leave open. 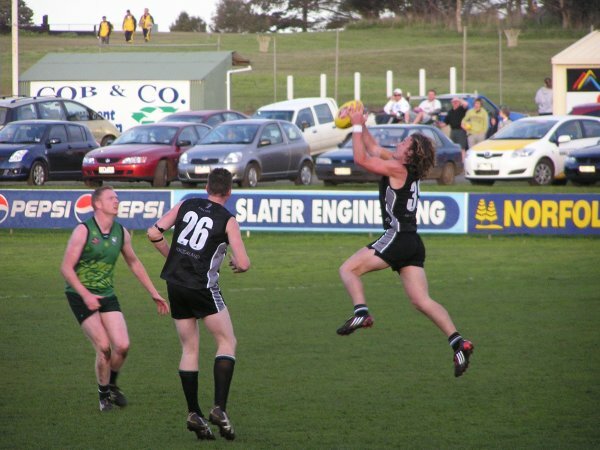 2005 goalkicking machine James Bowden, slimmer and fitter, was damaging on the ball, showing great poise. He broke a tackle 45m out and ran in to slot another for the Falcons, while around the ground big Brian O'Donnell was taking marks and following up on the ground for Ireland. Remarkably one of the fields umpires was the United States' Jeff Persson, who officiated in 2005 and has been playing for the Americans this Cup - not only has he done the double but done so in the same tournament. 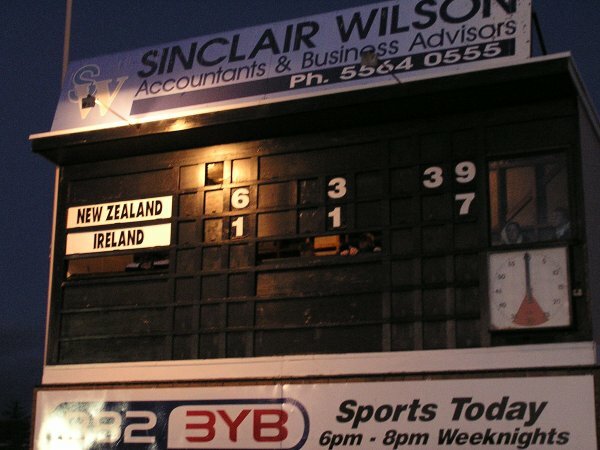 At half-time the Kiwis were up by 32 points, 6.3 to 1.1 and looked unstoppable, though Ireland had slowed them down. But they launched into the third quarter and again looked threatening in fairly dark conditions. The sun had set and the lights were on but they weren't particularly strong, though as good as most lights under which suburban footballers train through winter in Australia. Ciaran Keegan marked strongly but missed his shot on goal and the Irish were clearly competitive but never good to break down the Kiwi midfield and defence. The Warriors employed the huddle at centre half-back on New Zealand kickouts with mixed success, but the Falcons always had numbers back to stop forward thrusts. New Zealand's early goal was the only one for the quarter as the match became a defensive struggle. The crowd peaked around this period, with 100+ cars parked around the far boundary, a few hundred packed tightly into the main bar (out of the freezing conditions which felt about zero), and hundreds more braved the boundary on the clubrooms side. 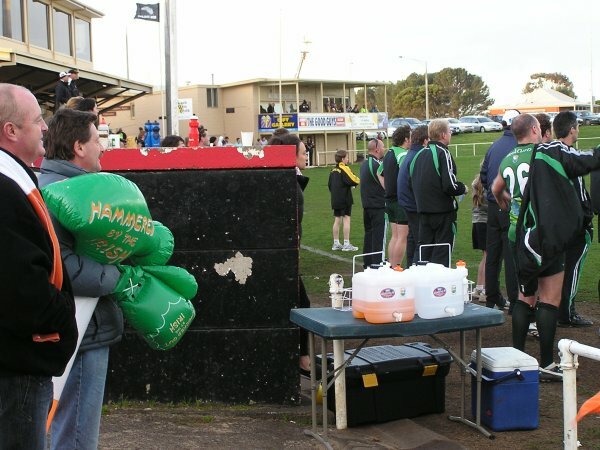 VCFL chief Graeme Allan described the crowd as bigger than last year's Hampden Football and Netball League footy grand final - the people of Warrnambool had not disappointed. A 40 point three quarter time lead stretched out just a fraction more as the final quarter. A goal to Moss Doran was answered by a late one from Liam O'Connor, and the final margin was 42 points. Ireland had played their best footy, moving the ball more cleanly and finding strong targets despite a strong opposition. But they had run into a very classy New Zealand side who look very threatening and will go into the Grand Final at the MCG on Friday full of confidence.